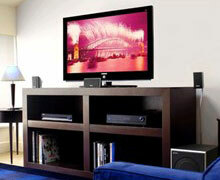 We are passionate about audio-video, hi-fi and achieving fantastic audio-video results. Professional Advice & Installations can make a big difference when it comes to high quality audio visual equipment. Our quality installers will help you get the best performance from your system with minimum hassle. We will install Plasma TV, LCD TV, Audio-Video systems ensuring our customers needs are completely understood so that end result will give You total satisfaction. Call us today and start enjoying Your New Digital system.